hand crafted by myself. I have worked at my respective crafts for over 39 years. My Leather Works are virtually Lost Arts. I have a workshop and a retail store. I am a Designer, Tailor, Craftsman, Manufacturer. I have been 39 winters in these mountains, wearing the items that I offer for sale. All of my work is of the finest quality money can buy. 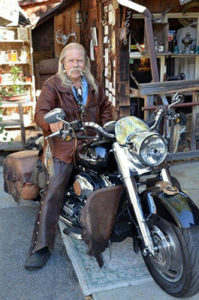 In beautiful mile-high Idyllwild, Calif. Town and Highway are Biker Friendly. I stand behind all of my work 100%. Enjoy a Walk Through My Store!